With 9.1 there are a lot of changes made to add more security to the system. One of them is is that you are forced to change the default passwords at the first log in. One exception is when you upgrade from a lower version, you will keep your current credential until you reset the security settings. So when you want to open the config of your system then you will get a new screen where you are asked to change the default credentials. Once you have done this and clicked on the OK button then you will get three notifications that the new passwords are set. 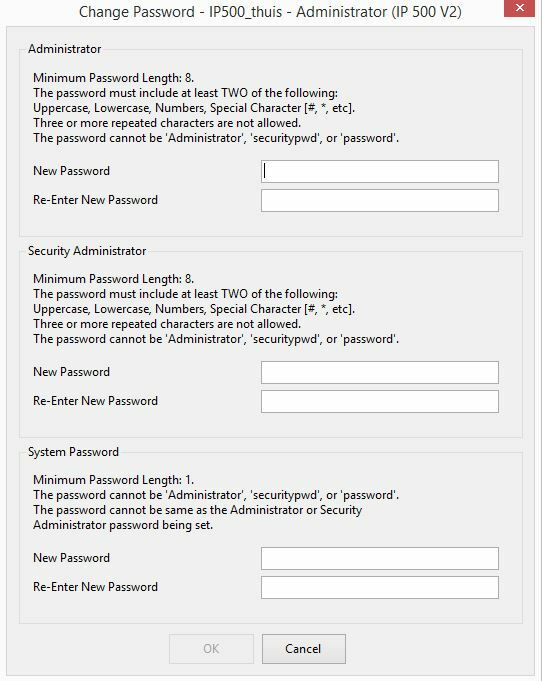 Personally i like to have the system password the same as the Administrator password. But as probably noticed it cannot be the same when you set the new passwords. Don’t worry as you can do that later. When you log in to the security settings with your new password then you are shown the general settings. A new option is the “IP Office user details” part. This option forces you to give every user a password enforcement. When you go to the section “System” you will see a tab called “Unsecured interfaces” when you can change the system password as mentioned before. You can change the system password in this section. 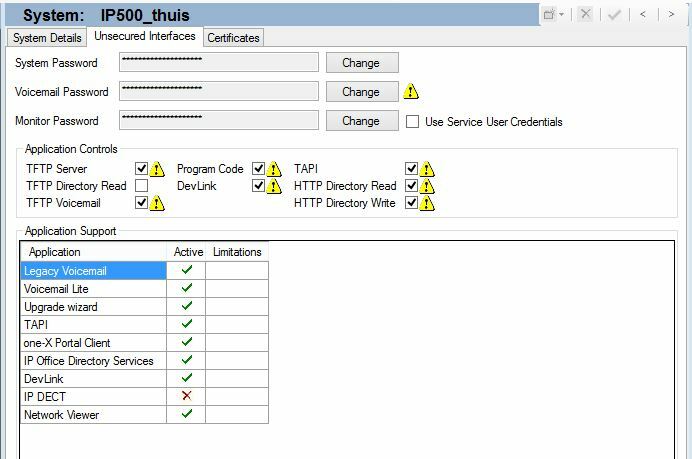 There is also a new option called “Use service user credentials” which forced the system to use the Administrator credentials. When you do not do that then your IPDect system is unable to read the directory and the IPDect phones won’t have a working directory. Another major change is the “Service users” who are not enabled anymore by default. As you can see the only enabled service users are the Administrator and EnhTcpaService accounts. The IPDect service account is disabled by default so if you want to connect an IPDect system then set a new password and enable the account. When you do not set a new password then your IPDect system will not work and the account will be set to disabled as there is no password match. When you install One-X Portal then also set a new password and use the same password when you configure the “Providers” within One-X Portal. 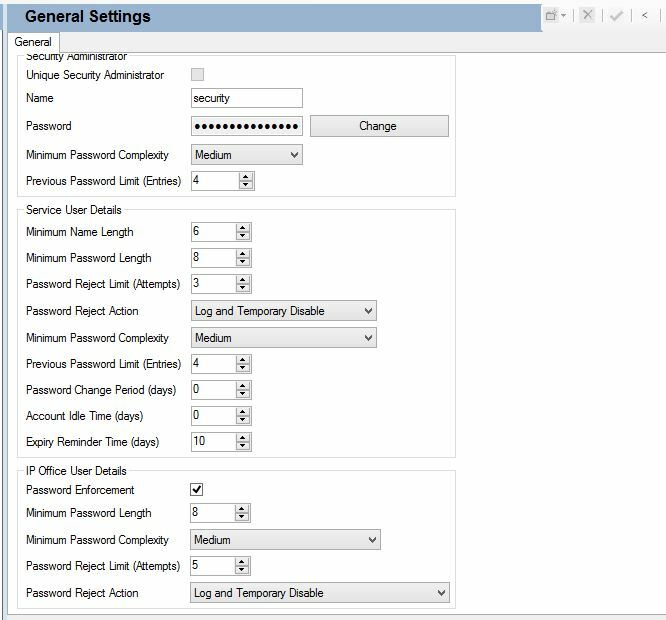 After settings the “Providers” password in One-X Portal check if the account is still enabled in the security settings.